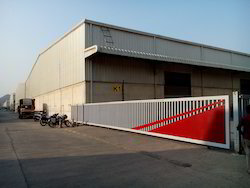 Leading Manufacturer of automatic sliding gates, automated sliding gate with rfid card system, telescopic sliding gate, sliding gate and swing gate from Mumbai. Offered in the market at the best rate possible, the Automatic Sliding Gates is known to have a high preference in the market. Its manufacturing involves the utilization of quality raw materials and modern machines, in accordance with the set industry norms and guidelines. Owing to this, the offered product’s functionality, resistance to corrosion and durability, are widely acclaimed. Production Capacity: 40 SQ. MT. 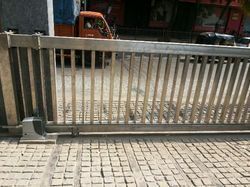 We are one of the prominent manufacturers and suppliers of supreme quality Automated Sliding Gate With RFID Card System. Owing to their easy operations and low maintenance, the offered gates are highly demanded. To maintain best possible quality of the offered gates, we have set up a well-equipped in-house quality testing unit. The offered gates can be customized as per the specifications provided by the customers. Marked at the most reasonable rate possible, the offered Sliding Gate, manufactured by us, are known to have a high demand in the market. Manufacturing done in compliance with the industry set guidelines and norms, its quality never deteriorates. For reasons of providing the best Swing Gate to our clients, we engage in using the finest raw materials and modern machinery in their manufacture. Owing to this, the offered product’s performance, user-friendly nature, durability and resistance to corrosion are highly commendable in nature. In addition, we comply by the set industry guidelines, for ensuring its standard of quality. Looking for Automatic Gates ?